And, when I presented this to my son as a project piece, he was excited because he likes this style too. It has that modern vibe with a retro throwback feel. However, the dresser had much wear to the top, but really only needed some minor TLC. Since Mr. I is not a newbie to furniture makeovers (see his past work here), he knew how to get started. In the end, he left the finish design up to me. haha. No problem! He grabbed my orbital sander and got to work. I suggested that since the top had veneer worn through that he save the parts that could still be stained, and do a paint/stain combo. (one of my favorite ways to finish these pieces) Since he wanted a masculine feel to the dresser, I suggested he use a mix of grays. First, to get this party started, Mr. I began painting the cabinet in the darker gray with the 2″ Angled Brush. Next, while the cabinet was curing, he moved onto the drawers. He stained them all in Early American , one of my faves seen in these posts. Last, he decided to add a twist of fun. Also, with the remaining colors, light gray and white, he used some tape to create the crisp lines you see below. Isn’t that sharp?! I just love it. Everything was topped off with a couple of coats of a poly to really make it shine. In addition, the pulls were repainted in a Pure Gold spray paint to add that bit of contrast. My favorite part, aside from the whole thing, is the etched mirror. I love how adds drama. You can bet I’m a proud mama to see my son do a fantastic job on this piece, and proud to say you can find this piece and all the other gems I have for you in my online shop. (SOLD) Stop by to see! 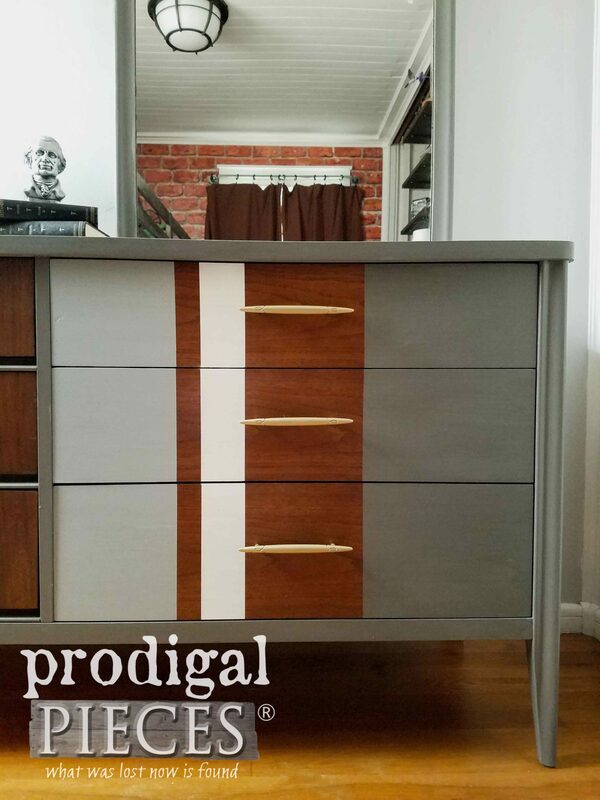 Do pin and share this vintage Broyhill Saga dresser makeover to inspire other to give DIY a try. It’s fun! Up next, this little lyre table was in need of much TLC and I couldn’t pass up the chance. Isn’t it cute? Head HERE to see the after. The paint and stain combo look great! I just started using Dixie Belle paint and have loooooved it! It goes on so well, especially with my Zibra paintbrushes. Sweet to hear. 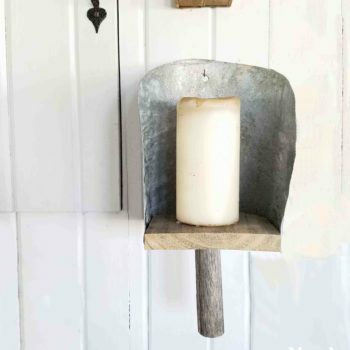 It’s easy to love as it works so well with any style and even in your home. Wonderful work Mr. I. Such a talented family. Really nice job Mr. I on the dresser – LOVE the look! I keep reading about how you prefer the Dixie Bell paints. 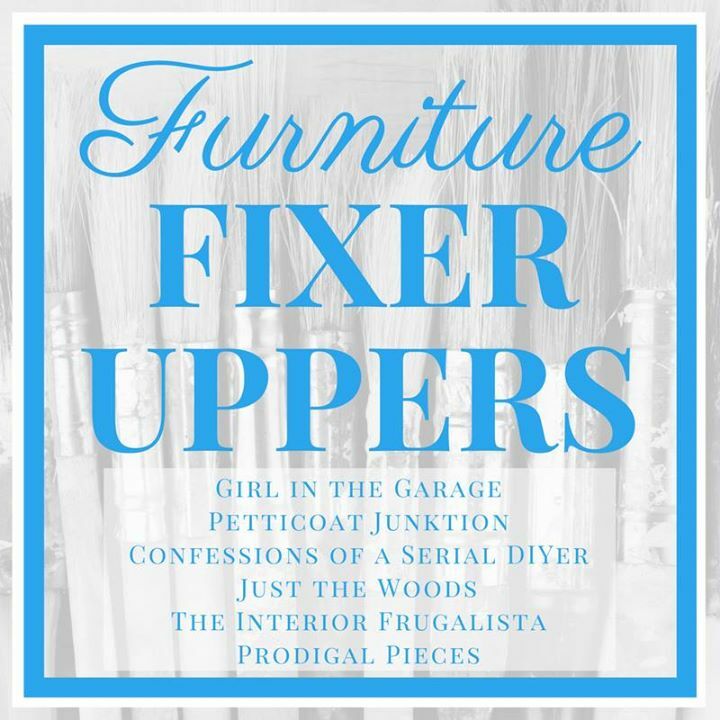 I’m one to not throw out, but use, all my old stock, so I’m still working my way through cans of latex and oil….but I sure think Dixie Bell would be a much better choice in fixing up the old furniture. I am always impressed by the coverage and the colors are awesome! Another wonderful read and great inspiration. Thank you. He says, Thanks! 😀 Yes, I am the same way, but instead of using what I don’t like I donate it to local charities. They love getting it all. haha! Thanks! What a score for you! Hope you can get to it soon. very nice! very, very nice! clean lines – not fussy, definitely masculine. I’m so tickled for him. He really like this piece and the colors. Fun to watch! He did a beautiful job! Thank you for saying so, Laura. I enjoy seeing my kids have at their own pieces. Fantastic job on this sweet piece and what a great eye for detail he is developing! I an new to refinishing and refurbishing and haven’t tried anything outside of standard latex YET. You guys inspire me so much. We’re delighted to hear it, Kelly. Thank you! Good job, love the combo of colors and stain! I appreciate that you kept the “feel” of the piece while giving it new life. So fun to watch him go. Thank you, Danelle. Great job! JUst love the colors used! The front looks so awesome! Fun to help him design this and watch him go. Thanks, Jackie! Fantastic job Mr.I! Love it! Thank you from the two of us, Jewell. So fun! I love the way that turned out, he did a great job. I love painted pieces that keeps some of the wood showing. I would paint a dresser my son has in his room that needs an update. It’s my favorite way to finish, especially in instances like this where the veneer couldn’t be saved. Thanks! Nice work! I have a bedside table I would like to try these paints out on. 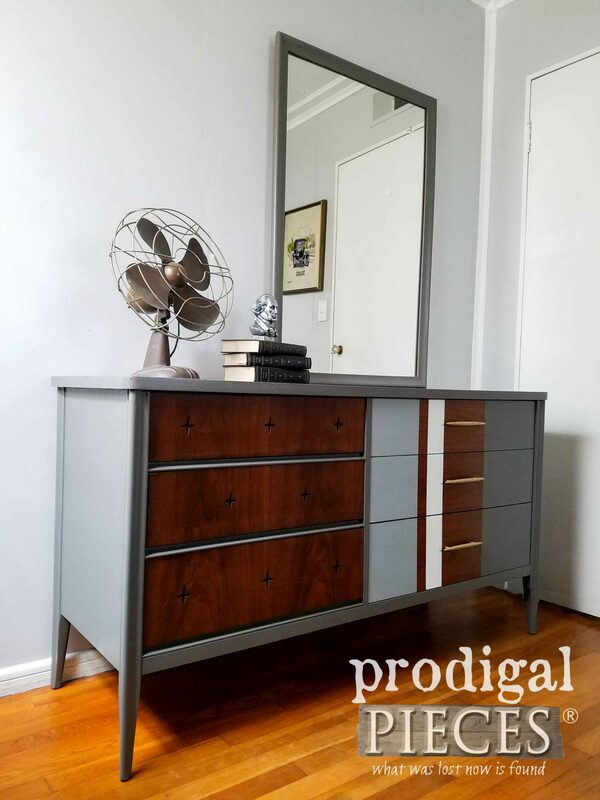 Looking to freshen up a newly acquired dresser… Hurricane Gray might be nice…! Handsome update, love the wood/paint combo! Thank you for saying so, Rebecca. He did a great job. Wow, that came out beautifully! Really nice job, Mr. I!!! Where to start with all the painting?! 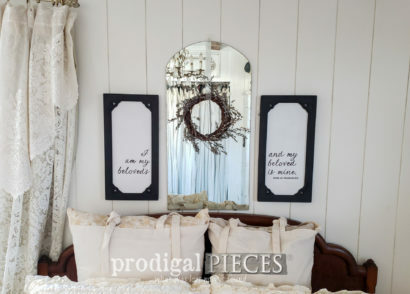 I’d paint my trellis first, then my girls bedroom furniture! I hear ya, Becky! I have much to do too. Kudos to Mr. I. He has obviously had a good teacher and has learned well. I would never have thought to do the color blocking on those right hand drawers . It is stunning. That means much, Sonja. Thank you! My nightstand would look lovely with some Hurricane Gray! Thanks! Funny how some of us had a stripe vibe this month, while others had pink. Love it! Beautiful make-over. He done a wonderful job. I would start off with my chest of drawers that has been sitting in storage for sometime now. Thank you, Colleen. Our pleasure! Thank you so much for the opportunity to win some of these awesome paints! Nice job. I would paint my office desk. Excellent job, Mr. I! This definitely has a “dudely” feel to it. Mr. I is as talented as his mother! Beautiful makeover and the wood/paint job is stunning! Even though I’m old enough to be your mother, could you adopt me and teach me how to do what your family does with repurposing trashures…lol. How fun! Thanks so much, Debra. You can come on over any time and join the chaos. haha! Great job on this project! I have so many projects, I wouldn’t know where to start! 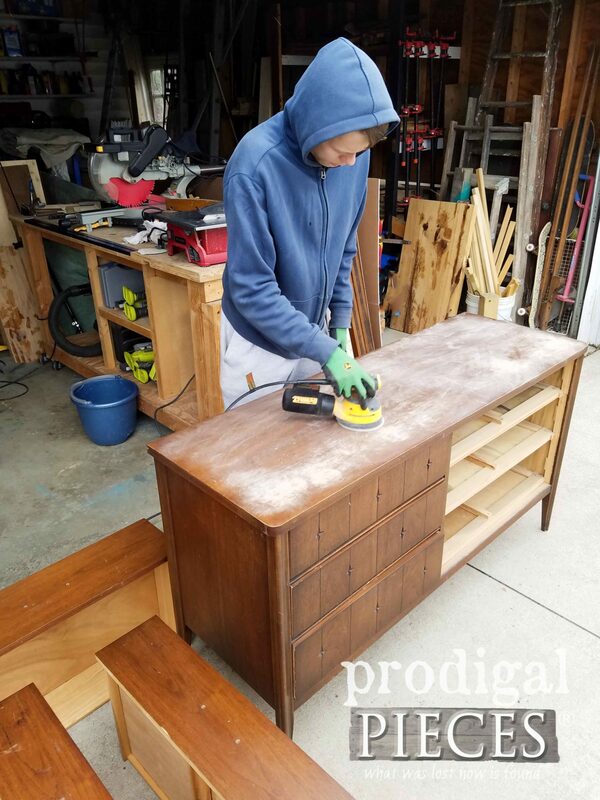 You’re training your children well – he did a wonderful job on that dresser! I’ve got several projects in my garage – just waiting for some nicer weather to be able to paint them, perhaps with some Dixie Bell colors! It makes my mama heart happy. Thank you, Denise. He did a great job. The colors reminded me of early modern. I have some old night stands that need a good make over! I think so too, but I’m partial. haha. Thanks, Kat! Great job. Looks so up to date. A new life for a good piece. That’s what he was after and we’re glad to hear you like it. Thank you! Awesome! Thank you. Love that you love this despite the gray. hee hee. The open with a finger grab underneath. Most MCM pieces are the same. Sounds like fun! You must be so proud the talent that all of your children have shown. Thanks for being the wonderful parents who take the time to teach skills to their children (and others like me!). 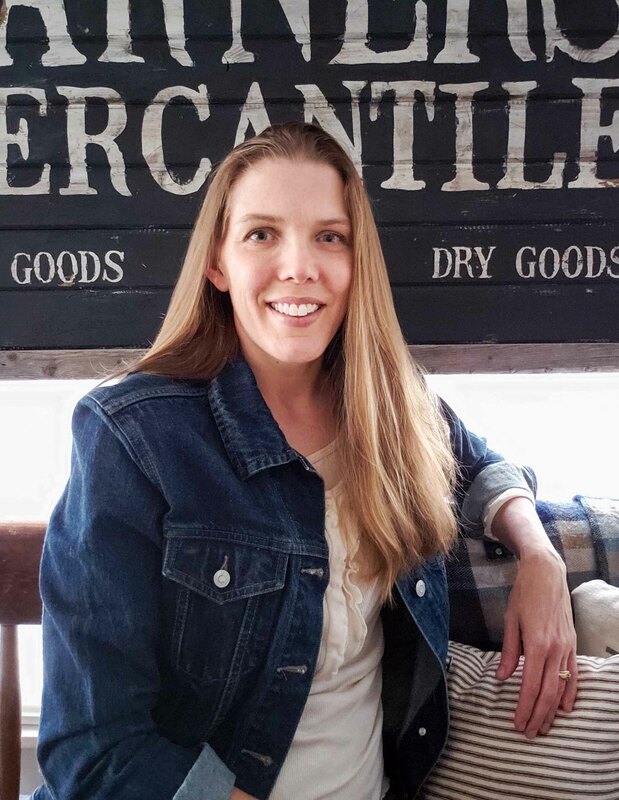 I have not been impressed with the chalk paints I have tried in the past, but have been wanting to try Dixie Bell because of all of their unique products and because I have heard wonderful things about them. I truly am and amazes me what they can do. I wasn’t impressed with chalk paint for years and actually gave up until I tried the Dixie Belle line. It floored me right out of the can. Hope you win to try! I truly like the dress make over. It displays talent, creativity and patience. I have not tried Dixie Bell, as of yet, I am just getting into the painting of furniture. I was one of the refurbish and stain people…and have decided to make the leap. We are delighted to hear it. Thank you. 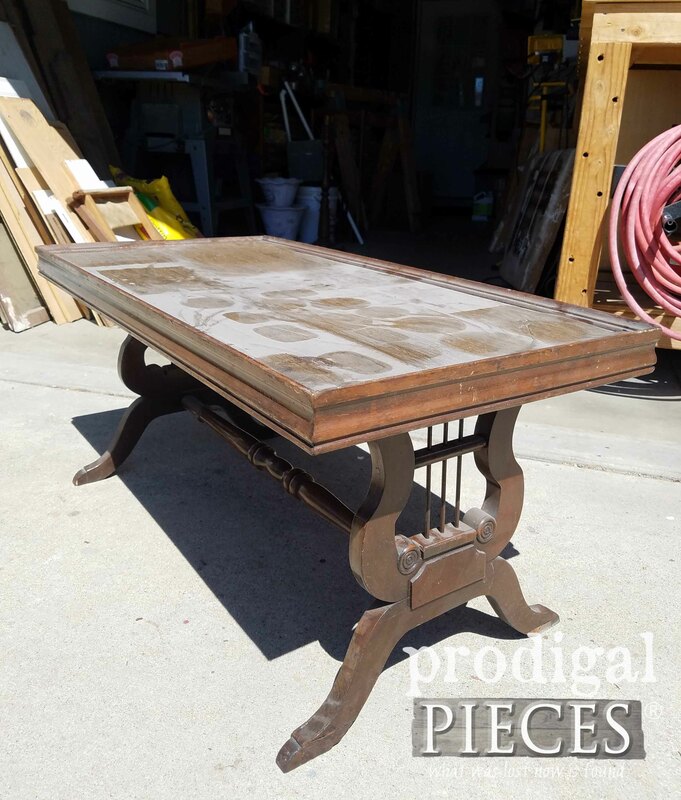 I am also a refurbish and stain when possible, but paint is oh so fun for those pieces that need some help like this one did. Makes me wonder how veneer gets worn through, like what were they doing to it? haha. He did such a great job! I love the mix of paint and stain! You must be so proud! Did he sand down the drawers before painting? If so… what grit? You are so right…I am! Thank you, Kayla, from the two of us. He did sand them down with a 120 grit and then stained fresh. You’ve got to be so proud of him and what he’s learned! What a fabulous makeover! I’d paint a few golden oak bookshelves that need a new life. I look for your posts every day because they are always inspiring. I like how your children are anxious to learn and do. Their projects are very good and professional-looking. I have a modern dresser too and would like to make it look sort of French country — Ha Ha you say. Good luck with that, right? I’m still hoping something will pop up somewhere. You’ve just made my day, Pam. Thank you! They would work with me daily if they could. Maybe one day! 😀 Sounds like your project piece will be fun. You can do it! Beautiful job! Mr. I takes after his momma!! 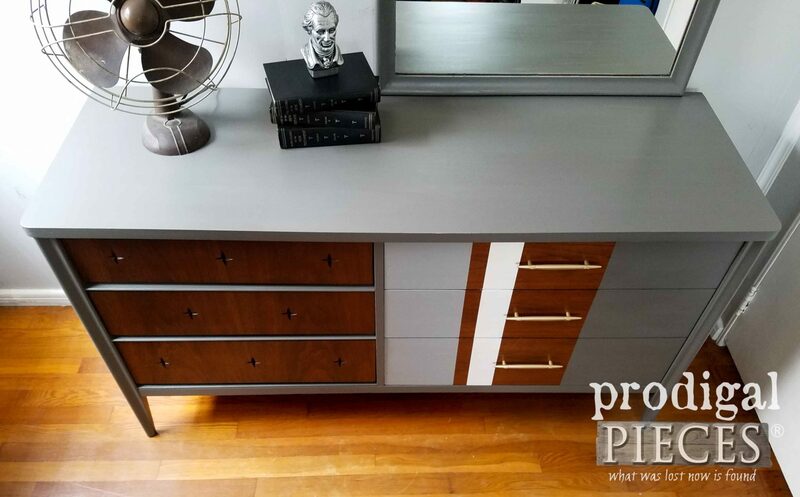 Love the color with the stain & the stripes with the offset mirror are just perfect! Awesome job! What a great job on the dresser. It turned out beautifully. I’d love to try out Dixie Belle paints on an end table. Very nice! He’s very talented.. I love paint and stain combos. I am on a break between semesters, for about a week and a half, and I’m finally going to tackle the dresser I’ve had sitting for over a year. I haven’t decided on paint/stain colors yet… I’ll decide after I strip it down..
Glad you get a break and hope you get to work on your piece. Good therapy for me, anyway. tee hee! WOW! Mr. I has a great eye!! This would have been a great piece in Zibra’s One of a Kind contest! I can’t wait to try Dixie Belle paint. I started sanding a shelf for our bathroom, but haven’t painted it yet. It sure would look good in Gravel Road! I was planning to paint it Orion Gray by Behr. Hey, I may even try some stripes! I do enjoy your posts so very much and am amazed at the talents of your children as well. You are an inspiration as an artist and a parent. Thank you for sharing! It sure would have been fun. You will love Dixie Belle. Best paint I ever tried and that’s saying a lot. 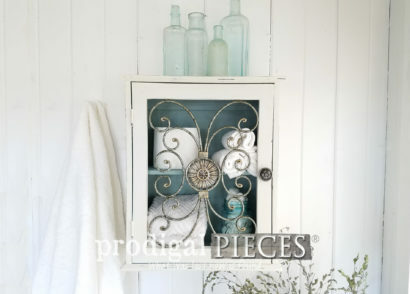 The first thing I would paint with Dixie Belle paint, is a small cabinet in wheels I want to make into a beverage bar! Mr. I did a wonderful job! I was wondering how to open the drawers on the left as I don’t see any knobs/handles? Thanks, Carolyn. The open with a finger pull underneath. Most MCM pieces have it on them for a flush clean look. Great job Mr.I! I commend you for instilling great work ethics in your children, Larissa. I have several pieces that could also use a face lift. Very cool Larissa. You know how obsessed I am about MCM furniture. Your son did well!! Me too! I wanted to work on this one. haha! Larissa, Yes, proud Mama indeed! Mr. I really did a super job updating this dresser! I love the colors that he chose, the design and the hardware painted gold. You deserve a huge round of applause Mr. I!!!! Yes, so very! Thank you, Kaycee. haha! So funny! I love that you’re doing it at all. Kudos to you! Awesome job by your son. If I won, I would makeover my husband’s desk. Thanks! Sounds like a sweet project. Now I’m very interested in trying Dixie Bell paints! sounds like they are very high quality. I used to say I gave up on chalk paints until I tried these. Blew me away! You bet! Thank you, Bryan. I love the makeover!!!! I would paint my mom old dresser. Sweet to hear, Valerie. Thanks! I love how you made it a family affair and are passing down the recycle not discard gene! Another beautiful piece! I’m sure the memories and the piece will be with you son for years to come! Thank you so much, Suzanne. We have a blast and can’t say enough good about your company and products. Thank YOU! Beautiful piece and classy redo of mid century modern. Thank you. We really aim to keep the story with the piece and just bring it new life when it’s too far gone for restoration. Glad you like it! Very nice job. It’s not often we see a piece of furniture so appropriate for the male in the family. How fun to get the kids involved. I love the stars and the gold handles! They wouldn’t have it any other way. 😉 Thank you! Forgot to say that Mr. I has a good handle on turning out beautiful work and well done on choosing really good colors. He does such a good job and I’m proud. He leaves the colors up to me as he’s still gaining his confidence. It’s fun to see his vision grow. Well heck, I hope I remember how to paint better than I remember how to comment! I have been reading lots of praise for this paint but live in the boondocks so haven’t bought any yet. If some landed in my mailbox and it was black, I’d use it to paint a round coffee table I’ve had in the basement since last autumn and that needs to replace a trestle style table from the late 70s. . Black and round will fit in well with my persian, middle-eastern and asian influenced living rom. I have so much stuff in our garage I would use this paint on!! I’ve always wanted to renew the furniture- this would be the time! You have done a wonderful job of sharing your amazing talent with your kids. 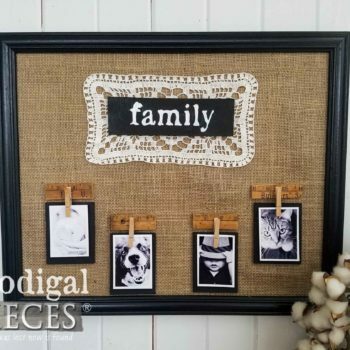 My grand kids were home schooled until they started 9th grade and one of the best things about it is the time they have with mama to learn and do fun projects. 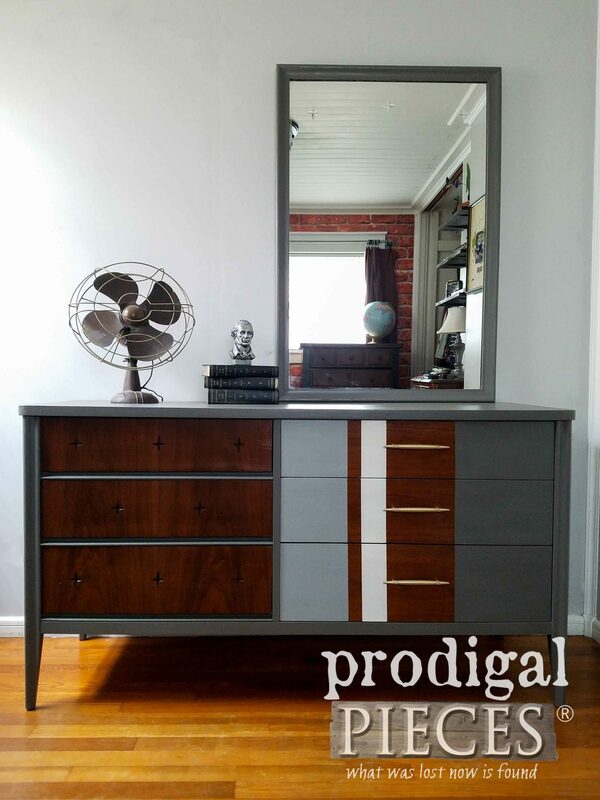 This dresser is so masculine, and the choice of paint colors was perfect. Really good job! How wonderful of you to say. Thank you, Carol. I truly love having the time with my kids. Awesome job Mr. I!! I so love the Dixie Belle color choices!! Thank you, Mary Ann! Me too! Hi, I have a Dixie campaigner dresser with big scratches in the top. I don’t like to paint old wood pieces but this one, or a MCM desk I bought, both seem beyond touching up and should probably be painted. Your son did a nice job! 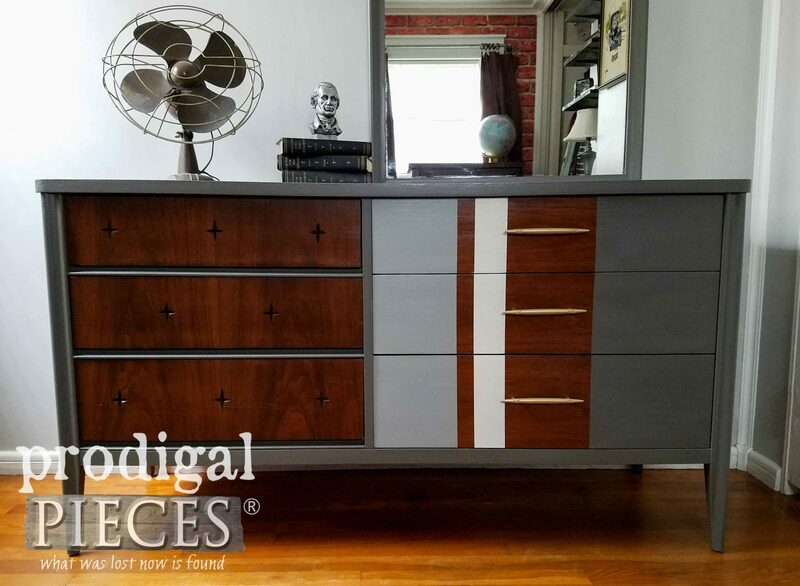 He gave the mcm dresser an amazing makeover. I would like to paint a wooden shelf with these colors. Thank you for saying so, Doreen. Sounds like fun! I usually do not like mid-century modern furniture makeovers because they just do not do the furniture justice. Mr. I’s, however, NAILED IT!!! 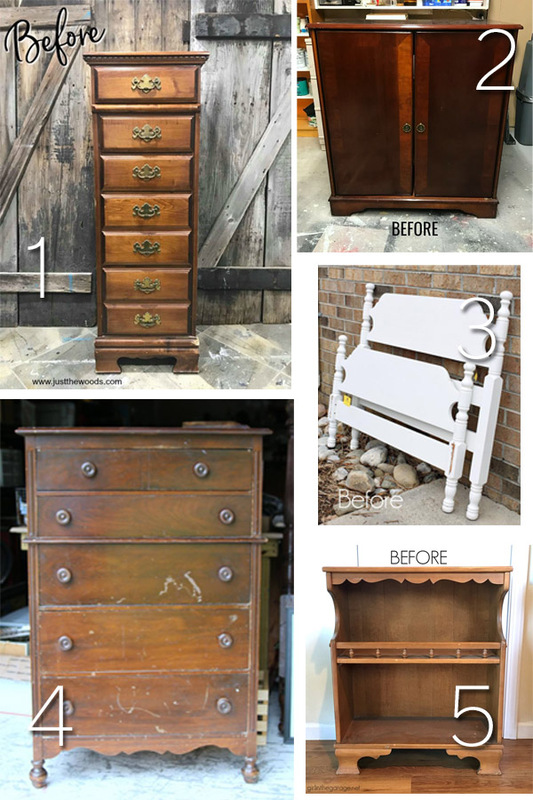 I absolutely loved what he did with this dresser right down to the gold handles! This is one of the best makeovers I’ve seen of mid-century modern! You have a very talented young man Larissa! I would love to try the Dixie Belle brand of chalk paint. I have used off brands and I have used Anne Sloan, which is my favorite and which is also the most expensive with the least variety of colors. Dixie Belle has a nice variety of colors and looks like it has a nice consistency to paint with. Win-win in my book! Thanks for the opportunity to try some! That’s pretty! I love the off-set mirror. Have an old Hoosier desk I’m dying to paint with chalk paint. I do too, makes it funky fun. 😀 Love old desks, old anything. haha. What a fabulous makeover. The colors and stain work so well together. WOW! Fantastic job on the dresser. Mr I had a great teacher and he has learned the trade well. He has every right to be so proud of his work, as do you. We’re both delighted to hear it. Thank you, Mary. I am so proud. What a great piece! So neat to see what the kids do. If I won this sweet giveaway, I would no doubt start with a table. I have a thing for tables. He’s loving all this attention. 😉 Thanks, Pamela! Wow! This is fantastic. He did an awesome job on the dresser. It looks great! I just started a side business of flipping furniture. I would love to give Dixie Belle paint a try. So happy to hear it, Michelle. Thank you! Hope your business is a great success. i love the makeover. I have a bookcase i want to paint. Thanks! Sounds like a great project piece. Wow, he did a fabulous job. This is one of my favorite makeovers from your blog!!!!! How awesome is that?! Thank you for showing him love, Karen. It is masculine! Always so happy to see young people with skills. 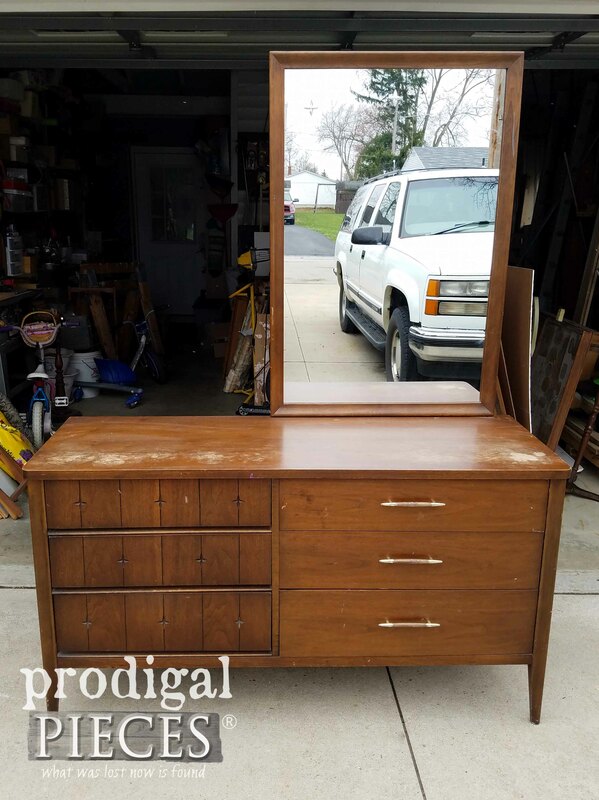 I would love some Dixie Belle paint to use on a dresser that I rescued from the side of the road and would like to turn into a potting bench. My tools and pots are scattered everywhere and need a home. Fun to hear – thanks! Your #trashure sounds like the perfect project. I LOVE this piece! This style has really been catching my eye lately & those colors &stain really compliment it. Your son did a beautiful job on it! I tell ya, the lines always draw me in. So clean and striking. Thanks for the compliments on his work. Love this – what a great color combo. Would love to win the prize package – nice present for my birthday!!! What a wonderful trade to pass on to your children! Love it. So sweet of you to say, Kelly. Thank you! Mr.I…….. you KNOCKED IT OUT OF THE PARK !!!!!!!!!!!!!!!!!!!!!!!!!!!!!!!!!!!!!!!!!!!! Wahooooo!!! You’ve made both of us giggle. Thank you! Wow nice job on the dresser. Love the stripes. What a really cool MCM piece, Larissa! You guys did an awesome job reviving it. Love the new look. 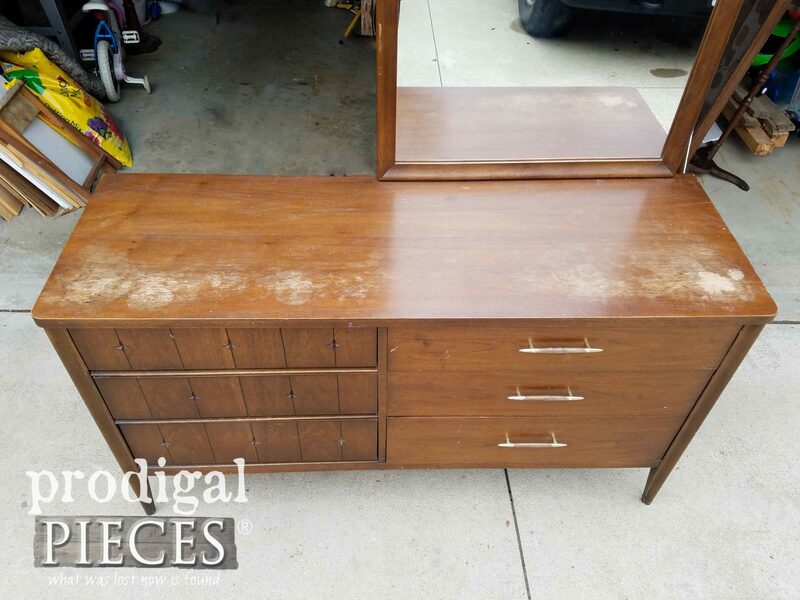 Your retro Broyhill dresser looks fabulous! I love seeing old pieces of furniture renewed and given a good life in someone’s home. Far too many people think they’re trash and just toss them. Thank heavens for people like you who envision a better life! Thank you for sharing this marvel with us. I’m with you. Fun for us, good for the environment, and just plain makes sense! 😀 Thank you, Barbara. Love this dresser! 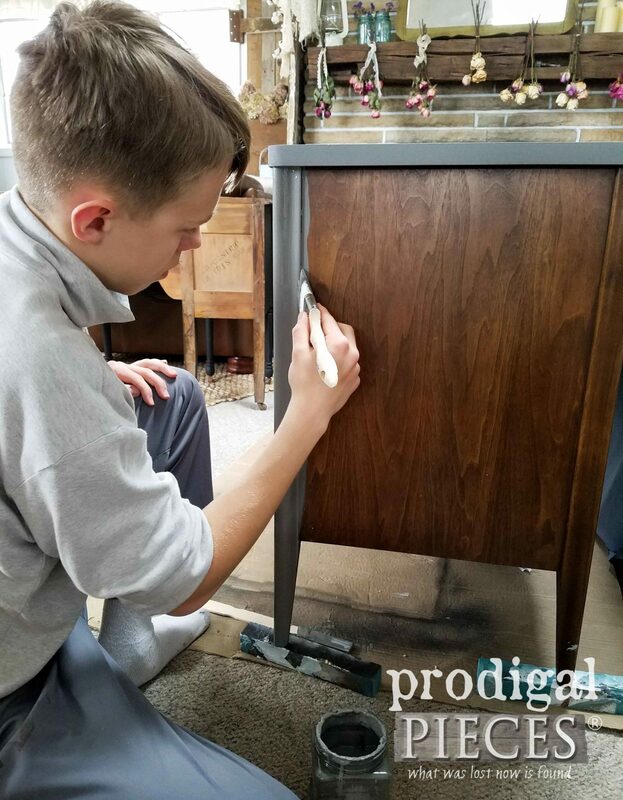 It’s a challenge (to me) to paint mid-century style furniture and have it look “right.” But you and your son were spot-on with this transformation! They can be tricky, but fun to try. Thanks! They are the best I’ve found. Glad to hear you love them too. Gorgeous. I really want to try and paint some nightstands I have. I need to get over the fear of getting started! Love these colors & shade of stain together! We do too – thanks! Thanks for introducing us to Dixie Belle! I have used Fluff and Cotton and am ready to get my hands on more colors. I love seeing your kids working on projects. My absolute pleasure. I believe in only sharing what I love and use in my own home and projects. It’s truly amazing what you can do with the right tools. I would have never thought of painting that’s dresser like that. Awesome!!! Wahoo! So fun to hear, Deidra. Thank you! Wow Larissa! Even your children have been blessed with creativity and a desire to execute! Mr. I did wonderfully! Great makeover, looks very modern. I’d paint my daughter’s dresser, she has had it since she was 3 and now she’s 13 and it was second hand when we got it for her, it’s been through a lot. I’d love to refresh it with a new paint job in an off-white eggshell color. Your son did an awesome job! Love the colors and design. He’s definitely gotten some talent from his mama. I’m not sure yet what I would paint with the Dixie Belle paint, but next weekend is my home town’s annual yard sale day – I’m sure I will come up with something! Such a talented young man! Takes after his very awesome mother! Such a fun thing to hear, Lisa. Thank you! I have never had the opportunity to try this paint. Would love to try it on an old dresser and bed we have. It looks so great! I mean, WOW, I wish I had those skills! You just made his day, Isadora. Thank you! I have this exact dresser. I love it so much! I just refinished mine and painted the body white, leaving the wood drawer fronts. We use it as a stand for our tv now. It’s my favorite piece of furniture!